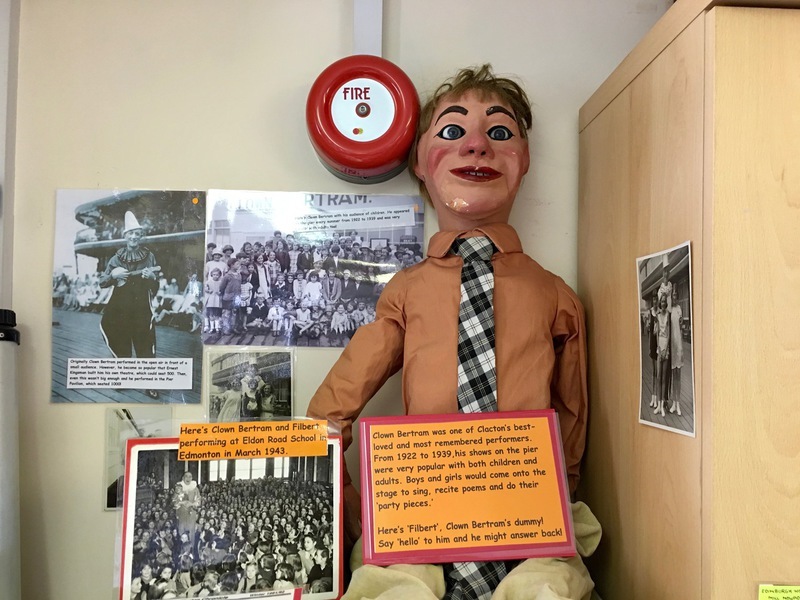 The Clacton & District Local History Society has in its museum a dummy called Filbert. Now approaching 100 years of age, Filbert is probably one of the most important acquisitions the Society has made in its 30 year history. So, who is he? Filbert is a ventriloquist's dummy. But not just any old ventriloquist's dummy as he originally belonged to Clown Bertram and was used by him throughout his long career in Clacton. Bertram, whose real name was Albert Edward Harvey, was the most popular and best-loved performer ever to appear in Clacton. He spent 18 seasons from 1922 to 1939 entertaining both adults and children in packed houses with many more disappointed would-be audience members locked outside. 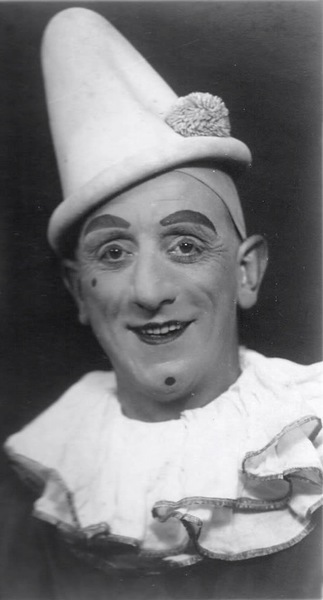 He came to Clacton in 1922, having had some experience of entertaining children at schools and birthday parties in London. On arriving, he approached the owner of the Pier, Ernest Kingsman, and asked him for a job. Mr Kingsman agreed to give him a week's trial to see how he was received. That one week's trial was to last for 17 years. At first, Bertram appeared in the open with a large carpet for the children to sit on and deck chairs at the back for the mums and dads. His performance consisted of a few songs with a banjo, some conjuring, competitions for the children and, of course, a riotously funny conversation with the irrepressible Filbert. He was an immediate sensation and it was obvious he needed something better than a carpet, so Mr Kingsman built him his own theatre, the Children's Theatre, near the end of the Pier. The building contained seats for 500 paying audience and was always full, with queues forming literally hours before the performance was due to start. Because of this, he was later moved into the Jolly Roger Theare (renamed the Jollity for him). This seated over 1000 and still there were many times when the house was full and people had to be turned away. After a while, Bertram began to employ juvenile professional talent. These became known as his "Bright Young Things" and they would sing and dance and take part in comedy sketches. As well as these young professionals, Bertram also held amateur talent competitions. Warren Mitchell (Alf Garnett) won a prize as a five year old dancer. Throughout his show, Bertram was noted for his quick witted ad-libs, which had the audience in stitches. His sharpness was his great strength and he played on it for all he was worth. Both young and old would cheer, clap, scream with laughter and everyone would get caught up in the incredible atmosphere created by this man. Sadly, the show ended when War broke out in 1939, and although he continued to appear locally in village halls after the War, he never returned to the Pier, apart from one “Victory Celebration” performance in the Ocean Theatre in 1945. He died in 1953, not long after giving his last show in Weeley Village Hall. In 1951, he wrote a letter to the Old Codgers letters page of the Daily Mirror. The appearance of his name sparked off such a correspondence that the editor of the Daily Mirror said that the result of mentioning his name had "staggered" him. He went on to say, "I have had hundreds of letters from mothers and fathers now with children of their own, all couched in terms of the greatest affection and remembrance of the Children's Theatre. I have never known such a wealth of affection for a man whom they met perhaps only once or twice, or one remembered for the pleasure he has given." The editor of the Daily Mirror had discovered something that Clactonians had know all along - Clown Bertram was someone very special and dear to the hearts of all who saw him.